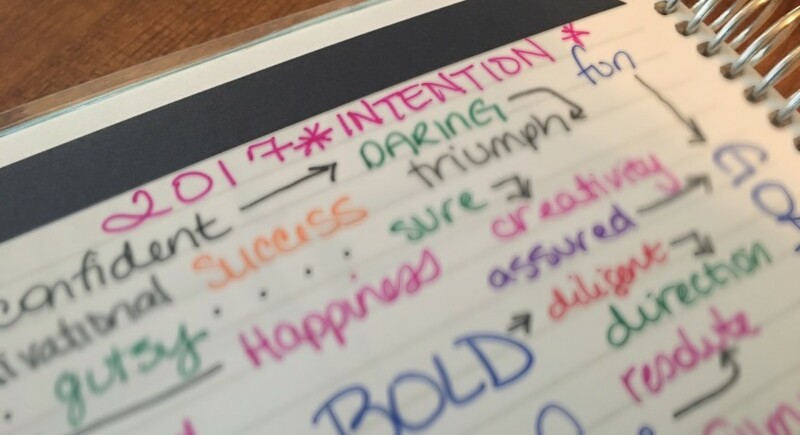 I recently saw a post on the FitBit blog about intentions for 2017. I *LOVE* that they used the word intentions instead of resolutions. I personally do not like the word resolutions, it is just something that will not happen (at least in my world). I love that it is defined as an instance of “determining mentally”. So much of what we want to do for ourselves, the dreams we have, the goals we have, are all basically mental. We have to convince ourselves first that we can do it. Many times – and I know many of you will agree – we psych ourselves out before we even begin. Don’t go into 2017 setting resolutions. Instead, set intentions. What do you “intend” to do? 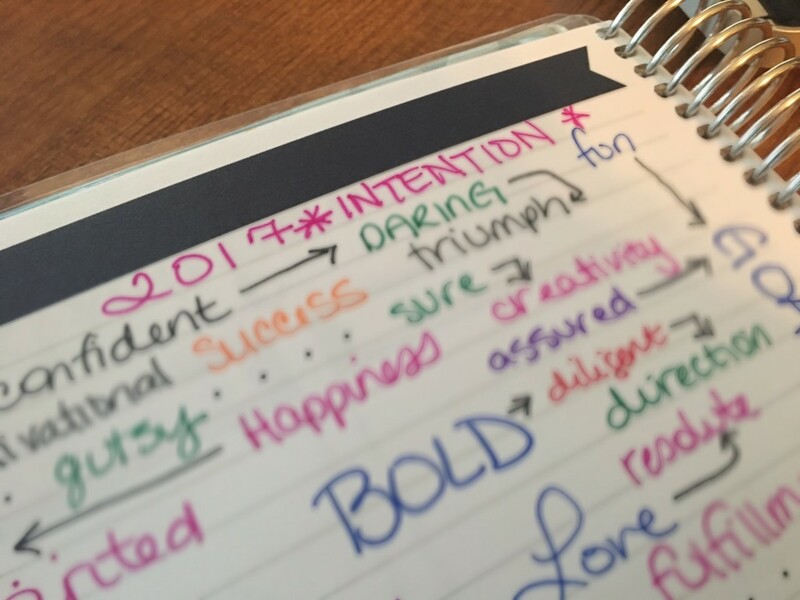 Over the weekend, I sat down with my fabulous new 2017 planner and made a list of words that I wanted to focus on in 2017. There are many words on this one page. All have meaning to me. Ironically, intention(s) is not on there, so I added it. And that brings me to choosing my One Word of the Year for 2017….. Intention. I intend to get back in shape with hubby. For the first time in years, we are back at the gym together and I love it. Very early on, before we were married, we went to the gym together. It’s nice to be back there together again. I intend to have more quality time with hubby. This is always on my list of wants and needs, and now intentions as well. There are some weeks where we are both so busy and our time together in few and far between. Even if we are just curled up on the couch enjoying our favorite show or out running errands, I enjoy our time together. 2017 will be OUR year. I intend to grow my Etsy store. This little store of mine on the interwebs is my current baby and I have enjoyed seeing it take on a life of it’s own this last month especially. It will be ever-changing as I add more items and fine tune the ones I have. I intend to make it a success. I know it will take time, but I will keep at it. I intend to blog more. My Etsy store took over blogging this last month or so, but I intend to get back to it. My 6th blogaversary is coming up in February and I have excitement planned around that. I want to blog my journey back to fitness as hubby and I work on it together. And I intend to grow the list of people and companies I work with. I intend to eat better. This goes along with the gym. Being busy means eating on the fly and that is never good. I intend on preparing more meals that both hubby and I enjoy as part of our journey back to being fit. I intend to be a stronger person. We all have our weaknesses. Mine is my anxiety and 2016 has seen it’s share. I want to focus on being stronger so that I can be a better, stronger version of myself. This will allow me to be a better wife, daughter, sister, friend, niece, and more. I intend to do the best I can in life. Life is hard, people. We all have struggles. Never ever think that you are the only one facing an uphill battle. If we can all go through this life remembering that while our struggle is difficult, we are not the only one struggling. We can all be more sympathetic in general. One way or another, we will get through our struggles. 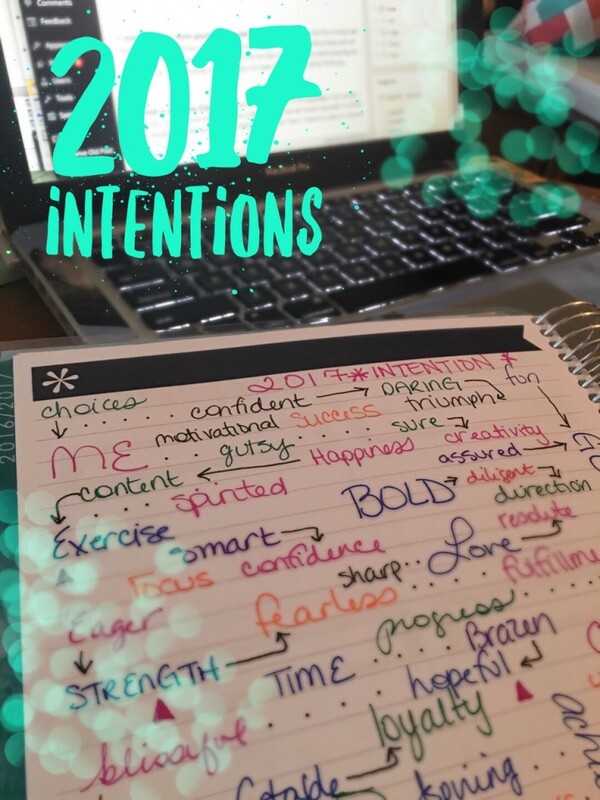 What is one of your intentions for 2017? I would love to hear them! I love the word intent too! I am a big goal setter and love seeing it all on paper this time of year! I love your goals – such balance girl! I intend on taking the morning for myself (personal development, workout, and Bible time) before hopping online to work. Yes, I have been getting up early to do my own stuff before I start to work. Makes me feel much less rush and stressed during the day. Thank you for stopping by and commenting!